the nytpicker: BREAKING: NYT Accuses Washington Post Editor Marcus Brauchli Of Lying To NYT Reporter About "Off The Record" Dinners. BREAKING: NYT Accuses Washington Post Editor Marcus Brauchli Of Lying To NYT Reporter About "Off The Record" Dinners. 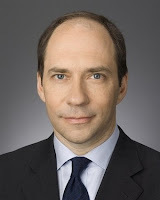 The NYT is calling Marcus Brauchli, the executive editor of the Washington Post, a liar. The NYT has reported this morning -- in a brief, buried "postscript" in the corrections column -- that it now has evidence that Brauchli lied last July when he told the NYT that he didn't know the paper's controversial corporate-sponsored dinner parties would be off-the-record. The NYT doesn't state flatly that Brauchli lied. But the juxtaposition of the two Brauchli statements in the postscript make clear the NYT's position that he misrepresented the truth in interviews with the NYT. In a July 3 page-one story, Richard Perez-Pena reported that the Post had abandoned plans to hold high-priced dinners that would bring together Washington lobbyists and Washington Post reporters and editors. The news created a media firestorm around the idea that the Post would sell access to its staff to business interests, and led to the resignation of the Post's marketing executive, Charles Pelton. Marcus Brauchli, executive editor of The Post, and Ms. Weymouth said they should have recognized the ethical issues created by the plan and ended it earlier. But they said they had not known all the details of how the dinners were being promoted — for instance, Mr. Brauchli said he had not understood that they would be off the record — and that those details significantly compounded the ethical problems. However, in a subsequent letter to Mr. Pelton — which was sent to The Times by Mr. Pelton’s lawyer — Mr. Brauchli now says that he did indeed know that the dinners were being promoted as “off the record,” and that he and Mr. Pelton had discussed that issue. The "Postscript" doesn't quote from the letter. However, by placing in its corrections column, the NYT is making the bold statement that the two previous statements by Brauchli to the NYT were false. Brauchli conferred with Pelton about the salon dinners. At one point they showed up at the newsroom desk of reporter Ceci Connolly, who covers health care, which was to be the discussion topic of the July 21 dinner. Subsequently, she said, "Charles asked me for some contact phone numbers and e-mails, which I provided." Brauchli said that Pelton believed that "in order for these things to succeed, they need to be on background. And I think the language went from 'background' to 'off the record' which, from my perspective now, [is] even worse." Alexander absolved Brauchli -- and publisher Katharine Weymouth -- of any direct knowledge of the parameters until the story broke on the Politico website on July 2. He reported that Brauchli forwarded Pelton's May email outlining the plans to top newsroom managers, but does not suggest that Brauchli read it himself, or knew in advance that the dinners wouldn't meet the Post's ethical standards. Why did the NYT not report this news in the paper itself, where the rules of journalism might have applied -- and where a reporter might have called Brauchli for his comment on the discrepancy? Was it hoping to bury the news on a Saturday, when the media hordes might not descend on Brauchli over this apparent contradiction? The NYT's brief statement doesn't address those specific questions. UPDATE: In Brauchli's letter to former Post marketing executive Charles Pelton -- the basis for this morning's NYT "postscript" accusing Brauchli of lying to the paper -- Brauchli claims that the NYT reporter "apparently misunderstood me." In acknowledging for the first time that he knew the controversial dinners were off the record, Brauchli said he explained to NYT reporter Richard Perez-Pena that "my original intention had been that the dinners would take place under Chatham House Rule -- meaning that the conversations could be used for further reporting without identifying the speaker or the speaker's affiliation." Brauchli stated definitively to Pelton in the letter that "I knew that the salon dinners were being promoted as 'off the record.'" But when Perez-Pena's stories appeared and suggested otherwise, Brauchli made no attempt to clarify or correct the NYT articles. "I should have said something at that point but did not," Brauchli wrote in the letter to Pelton, dated September 25, and published this morning by Politico. However, in McNulty's statement to The NYTPicker today that "the note speaks for itself," the NYT is clearly stating that it doesn't believe Brauchli's version of events. The postscript made no mention of Brauchli's claim in the letter that he had been misunderstood. UPDATE: "The letter speaks for itself," says Kris Coratti, communications director of the Washington Post, in an email to The NYTPicker responding to our requests for comment from Brauchli. It's probably not a coincidence that Coratti's comment is virtually identical to McNulty's statement on behalf of the NYT earlier today. you look lame when you leave "BREAKING" up as a headline 2 and a half days later. Besides, this whole story is lame. But since you ran it you might at least have posted about Brauchli's response on his WaPo chat today.